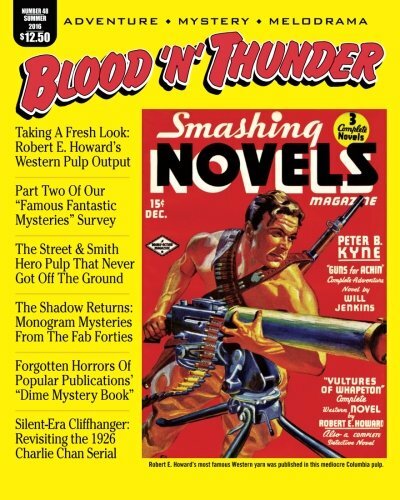 The latest issue of BLOOD 'N' THUNDER continues our survey of FAMOUS FANTASTIC MYSTERIES, that most underrated pulp reprint magazine. Readers will also find extensive coverage of important vintage films: the 1926 silent serial that introduced moviegoers to Charlie Chan, and the three 1946 whodunits featuring The Shadow. Western yarns by Robert E. Howard, creator of Conan the Barbarian, are examined and defended by Howard scholar Morgan Holmes. Prolific novelist Will Murray contributes a piece on a proposed Street & Street hero pulp that was to have had a time-traveling protagonist and be edited by the legendary SF writer John W.Campbell. Other articles focus on such rare pulps as DETECTIVE DRAGNET and DIME MYSTERY BOOK. Also in this issue: pulp advertising materials and high-resolution images of pulp-cover paintings.